Galileo G, the second in the Philippe Briand-designed Vitruvius series of superyachts, has been delivered to her owner in a small ceremony at Perini Navi's Picchiottiyard in La Spezia. The 55 metre yacht, whose launch and sea trials we reported in August, has been designed to be lean, green and energy efficient with her wave-slicing bow and streamlined superstructure. 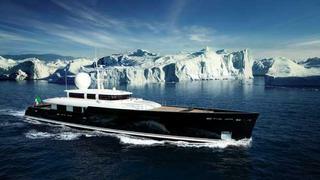 Ice classed, she will be traversing the Northwest Passage from the Atlantic to the Pacific through the Canadian Arctic. Look out for the full feature on the superyacht masterpiece that is Galileo G in the November issue of Boat International, which goes on sale Thursday 13 October. Next in line and the third yacht in the Vitruvius series is a 73 metre motor yacht, known only as hull number C2189 for now, which is currently being built at the Perini Istanbul-Yildiz yard. After initial hull construction she is due to be transferred to La Spezia for finishing off early next year, with an anticipated launch date in early 2013.